What Level of Carbon Pricing Would Limit Climate Change? Carbon pricing is a complicated topic, but one question in particular is usually overlooked in the flood of carbon pricing conversations. 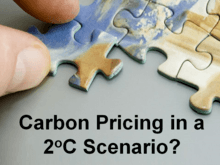 What level of carbon pricing would be required to limit climate change to 2oC? There is no simple answer, but this Doorway pulls together information and insight you can use to explore the question (and answer) for yourself.